What do YOU think that the next wizard should be like? [Wood chopper wars. Relate to leaf cutter wars]. The leaf cutter wars was a sortilege vs straywood, when the wizard did experiments, that led to the creation of the darkfenne. Wood chopper wars: wychwood vs sortilege? I think that she should have an ability that punishes the opponent for casting too many spells, (Synergy with gate to Voltari). I have almost no inspiration for a cool alternate wizard. I'm guessing she could have abilities related to the "wind" subtype. Maybe she'll have more control abilities instead of the agressive/defensive abilities of the current one. I believe the set will more likely be alternate wizard + alternate forcemaster instead of druid. I would doubt it. Arcane Wonders will probably reserve something that different for a new Mage instead. Maybe an arcane and mind one? If you're looking forward to a Chronomancer, the bad news is that several new Mages have just been revealed (in the new podcast). If the Chronomancer is even a thing, it won't be coming out for a very long time. Is the staff in her mage art a Staff of Storms? The art certainly makes her look more in-tune to nature than the existing male wizard. Thematically, perhaps she regrets the decisions made by Sortilege Wizards to manipulate the natural world that resulted in the Darkfenne abominations? Looking at promos and such, I could see her getting discount(s) for the Air (and possibly Water?) elemental school(s), and an ability that might give her Damage Type +1 for "Wind" (and possibly "Hydro"?) attacks. This would work well with the Gale Force Ring (which doesn't directly increase damage), Wind Storm and Sandstorm attack spells, etc. Her image also shows up on Acid Blast, which may or may not imply some training in the Water school. In terms of creatures, there seem to be a lot of Nature-school promo creatures that could work with her, including Oscuda (who has a poisonous "stink cloud" attack), Lightning Beetle, . Her spell book might also feature the Gloves of Skill to help with her ranged Wind attacks, and Lightning Strike might help her melee creatures. And having some sympathy for Nature might also be reflected in Raincloud. Aside from that, I wouldn't be surprised to see Wall of Poison Gas show up with her (and maybe more copies of Poison Gas Cloud?). And of course any expansion that includes a Wizard would be a good place to print Mordok's Tome. I could see her in a Kumanjaro-like expansion paired off against the male Forcemaster. 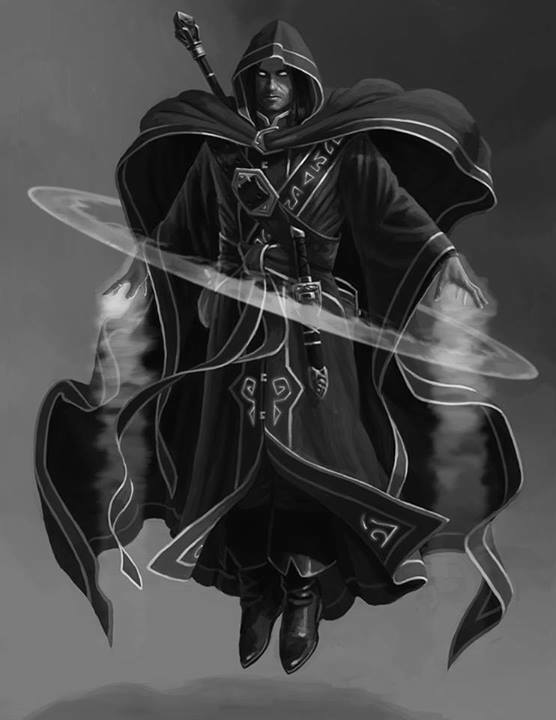 His spell book might feature Wall of Force, Chitin Armor (to counter the Wizard's Acid Blast), Flame Strike (mostly to compliment Lightning Strike, but emphasizing the aggressive style of the Forcemaster), and presumably a bunch of Mind-school spells we haven't seen yet, including something that allows a mage to gain flying - perhaps just temporarily, maybe via a "Levitate" Incantation? The alt wizard should be able to manipulate time and forsee the future. She will be able to add dissipate tokens to extend enchantments and or conjurations. 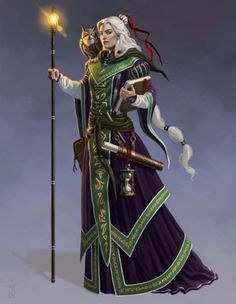 I think it would be cool to have her be able to like project spells and or use mana from her next turn so she could decrease in channeling temporally but use it on certain spells. This may be only on certain things that revolve around time or have a time trait. Also the ability to maybe have the option to to do actions back to back. Again it might be only available for creatures who have a time trait, that can manipulate this ability. - At the beginning of the upkeep phase, for each opponent, you may look at one of your opponent's planned spells. Then, you may pay 1 mana to change one of your planned spells. Anyway i would definitely prefer alternate druid and forcemaster and maybe necromancer over wizard. I'm also not huge on the wizard, but I suspect that he'll be the alternate mage since he is a core set mage and still did not get expansions. I believe it was due to the meta, but since that problem is solved now, they could bring out the next one. Forcemaster is weak against druid. And what could they possibly do for an Alternate Necromancer? Better idea, use mummies and ghosts. The problem is that this is based on the thematic theory of FM, rather than how the competitive builds play. Also you don't engage creatures more than you have to, and concentrate on the mage. I agree an Incorporeal Necromancer would be the right way to go next. There was nowhere to go for Wizard and no point trying prior to the errata, but the field is right open now, there are a lot of possibilities. I guess we will see more wind and lightning spells. But I also guess that we have enough time before that expansion would go out. There weren't enough tournament games to see how competitive is the post-errata wizard, so we would probably see warlord academy and forcemaster academy first (or at least one of them). I expect the Staff of Storms will be in the alt-Wizard expansion (unless it's in Lost Grimoires v1? ), perhaps along with a new Ring that deals with "time" spells (e.g. perhaps grants an Arena Wizard the ability of the Academy Wizard to add Dissipate tokens? And maybe reduces the casting cost of spells with the "time" trait, if one is coming). *edit* Or better yet, "Whenever you place 1 or more token(s) on a spell you control, you may pay 1 mana to place 1 additional token on that spell." This would allow you to put 2 per upkeep on Staff of Storms, for instance, and add +1 when you cast a spell with Dissipate, not to mention Banish, etc. Have to be careful with the wording (e.g. check all spells to see which say "token" and which say "marker") because, for example, you wouldn't want to add an extra Growth marker each time a creature gets one of those... too powerful! After alt-Wizard vs alt-Forcemaster (for which there has been some art floating around for years now), I'd love to see an Egyptian themed female alt-Necromancer (with mummies and undead cats and such) vs alt-Paladin (not sure of the Paladin's theme/inspiration - but holy vs unholy is always fun and hasn't been done in Mage Wars yet, with Academy Priestess and Warlock showing up as separate sets). Then maybe alt-Druid vs alt-Siren would be neat, with the Druid leaning towards insects (hive/bee/arachnid/ants, along with more plants/vines) and the "Siren" being more of a Pirate, with special abilities favouring pirates over fish, but also including a new shark or two to flesh out the other Siren strategies (e.g. either Siren could be used in either a Shark/fish or Pirate/ship strategy, but the current female Siren might be directed more towards under-the-sea aquatic creatures while the male alt-Siren might be more into pirates and sailors - analogous to how the Arraxian Crown Warlock leans more towards melee + curses with a splash of demons (Reaper) and fire spells, whereas the Adramelech Warlock is primarily fire + demons (especially those with flame attacks) with a splash of curses (to strengthen demon attacks). An alt paladin would be interesting. maybe he would have a different valor ability. Maybe the alt paladin could be a little less aggressive, using more tactics to try to settle most issues peacefully, but when he does need to attack, his attacks are harder and stronger? Like, "If this mage did not melee attack this round, he gains 1 valor." And then as a quick action he can spend X valor to gain melee +2X. In some franchises, paladins are more passive and supporting rather than melee combat specialists. Imagine a drawback like Melee -1 (opposite of Battle Skill) to really discourage melee combat, but then having strong supportive auras and healing abilities. Might step on the toes of the Priest/Priestess a bit, though. Hmmm. Maybe not. It's tough to make a knight-like melee fighter and a supportive healer that feels different from the existing Paladin, Priest and Priestess. The current paladin is basically a show-off Mage. He basically gains valor by impressing/appealing to his god(s) with a show of justice and honor. Having more valor is basically having more favor with his god(s). So what I imagine for an alternate paladin is someone with good intentions but harsher methods. Imagine a paladin who is a zealous follower of the dawnbreaker, rather than asyra. Rather than making appeals based on honor like the current paladin does, he would make appeals based on justice/vengeance. So maybe something like a "vengeful challenge", "when you attack an enemy creature that attacked and damaged a friendly creature this round, you gain one valor." Or even "when the paladin attacks and damages an enemy creature with a counterstrike, he gains one valor"
And he could have an aura that gives him the vigilant trait that costs 3 valor, or something.